In a ten minute video posted on Facebook, Thrillist have shown the striking similarities between Stranger Things and secret government project which was conducted between 1971-1983, deep beneath the surface in Montauk, New York. The video features clips of Christopher Garetano's 2015 film 'The Montauk Chronicles'. Garetano spent ten years researching the mysterious Montauk Project, which is not only the subject of his docudrama, but also seems to be the inspiration behind the hit Netflix web series. In Stranger Things a secretive government project, under the guise of the Department Of Energy, is conducting experiments on children with psyonich abilities, at their secure facility known as the Hawkins National Laboratory. The real life version of the lab was at Camp Hero State Park and was formerly known by the name Montauk Air Force Station. Now derelict, its located on the eastern end of the South Shore of Long Island. According to the filmmaker, the Air Force base had the most powerful radar dish in the world, but conspiracy theorist believe that this huge transmitter was used as part of a dark project which experimented with mind control on the general population. What makes conspiracy theorist think there's more to this military base than a radar station? The rumours began to circulate in the early 1980, two men who claimed to have been stationed on the base started to recover suppressed memories of their time there. Preston Nichols and Al Bielek claim they were brainwashed after being discharged from the army and had their memories of the base removed. According to their stories, Camp Hero hides a massive, subterranean laboratory. It's in these underground labs that top secret experiments were rumoured to be conducted. Initially the mind altering technology was tested on the locals, who reported experiencing strange dreams, head aches, and claimed that animals were behaving strangely. Just like in Stranger Things, it's said that children played an important role in Montauk's experiments. They were often mistreated, pumped full of hallucinogenic drugs, and their personalities were removed, making them a blank canvas ready to accept mental programming. Al Bielek then worked with the children to enhance their psychic abilities and teach them skills like remote viewing for the purpose of spying, and even how to manipulate their surroundings using psychokinetic powers. The experiments weren't just limited to the human mind, Preston Nichols, who has degrees in parapsychology, psychology, and electrical engineering, claims that the base was also involved in experiments relating to time travel and teleportation. He also claimed that government researchers at Montauk had made contact with alien life and were using extraterrestrial technology in their tests. One such alien device was known as the "Montauk Chair" and was said to be able to manifest thought into physical reality. A powerful psychic, like a real life version of Eleven, would sit in the chair and think of inanimate objects which they would try to conjure up into our reality. Like in Stranger Things, there are claims that the real life experiments managed to summon a creature which caused havoc and ultimately shut down the project. Montauk's version of the demogorgon was nicknamed "Junior". You can buy the film on DVD or Blu-Ray through the projects official website and Amazon, or you can watch it online by renting it here. The Montauk legends were told around crackling camp fires and secret gatherings, for years, before they became popular around the world. 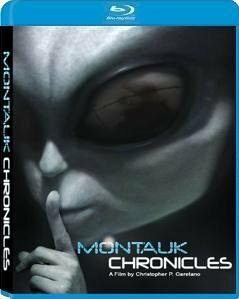 'Montauk Chronicles' is the first motion picture to examine the Camp Hero legends and the phenomena that surrounds them. Some say, that between 1971 and 1983, deep beneath the Camp Hero air force base, there were bizarre and brutal experiments conducted by a clandestine organisation, from another world. Now, hear the story from the very men who claim to have been there. Movie maker Christopher P. Garetano examines the paranormal legends, illustrates them as cinema as the alleged survivors tell their harrowing tales. Spotted all the 80s references in Stranger Things yet? Check out our Stranger Things Episode Guides, test your knowledge in our Stranger Things 2 quiz and read our A to Z of Stranger Things 2.